Whether you live in a hot climate prone to heat waves or your car leaves you stranded on an extremely hot day, there are things you can do to lessen the chance of heat exhaustion, heat stroke and a heat related fatalities. Every year in North America, it is estimated that over 500 people die due to the effects of extreme heat, including illnesses like hypothermia. In order to avoid becoming a statistic, make sure you are prepared for it whether in your home or traveling on the road. A heatwave is a period of unusually hot summer weather that lasts more than a couple of days. They are generally worse in cities as the temperature in rural areas tend to lower at night; whereas in cities, temperatures will remain high throughout the evening due to cars, buildings and other typical modern conveniences. Stay in the coolest place available. (This may not necessarily be indoors if you do not have air conditioning.) If your house temperature exceeds the temperature outside, find a cool place to go. Most public buildings are air conditioned, and if you cannot get there, basements are usually cooler than the upper areas of houses. Try not to be in small enclosed areas with no ventilation and NEVER leave pets or children in cars (even with the windows opened) or in the direct sun for too long. Try to cool yourself down by using electric fans, water-soaked sheets, hats and bandannas. Soaking your feet in cool water is also an excellent way to cool down. If there is also a drought-warning in effect, try to keep your use of water to a minimum and be sure to make use of fans and opening the windows at night, when the temperature is cooler. Using mentholated products on the skin, or aloe vera cooling gel can also help to make your body feel cooler. Be sure to hydrate yourself by drinking water and low-sugar juices. Do not drink caffeinated beverages or alcohol as these will deplete your body’s water supply. If you have pets, you will need to remember to hydrate them on a regular basis as well. If you have to be outside to work or for any other reason, be sure to wear long, light (colored and textured) and loose clothing. Hats and sunscreen are also necessities. 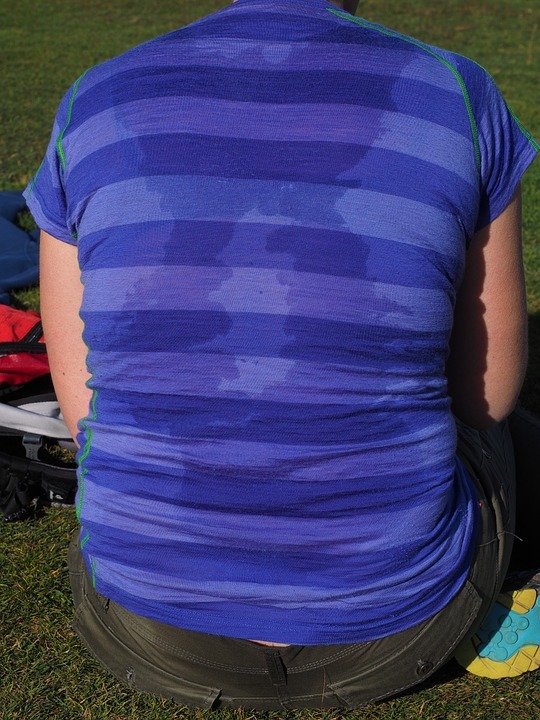 Try not to do any strenuous activities during times of extreme heat if possible, especially in the direct sunlight. Because high-energy appliances and incandescent lights can zap energy and heat up the house when turned on, try to have them turned off during the day. Use your microwave to cook and be sure to eat small meals that are lower in protein and fat. Spicy food really does help cool the body down so have small meals with a little kick if you can handle it. Because heat waves can cause rolling blackouts, it is advisable to keep an emergency survival kit in your home or at the very least a self-powered radio, flashlight, and fresh water, just to be safe. If you are going on a road-trip during a period of extreme heat, or simply in the summer, in a less frequently traveled location can prove to be a harrowing experience if your vehicle breaks down and you become stranded. Always carry an emergency kit in your car or at the very least, be sure to bring water with you when traveling by car. These kits should generally include: water, granola bars, blankets, flares, self-powered source of light (lightsticks, flashlight), matches, and a first-aid kit. You should try to do anything you can to be seen. Vehicles are big and therefore easier to see, so try to stay near yours if possible (they are also useful for shelter). Signals of any sort are a great way to be seen as well. For daylight hours – smoky fires, mirrors (or any reflective surface or device), and an S.O.S. printed in big letters on the ground are useful; flares and bright fires work the best during the evening. Keep your clothing on during the day but loosen any tight clothing and be sure to have something covering your head. Again, be sure to hydrate yourself. You should drink once per hour, moisten your lips and try to breathe through your nose as well. If you are stranded for a longer period of time, good sources of water can be dry stream beds (dig down a few feet) or the base of cliffs. Keeping your cool during a period of extreme heat is not the easiest thing to do, but if you follow these helpful tips and take a few precautions, you may save yourself from a potentially deadly situation.